This 3-hour dining tour of downtown Los Angeles showcases the trendy food scene of Downtown L.A. (or DTLA, as the locals say), as well as old favorites. Stroll through the historic core neighborhood, learn about its fascinating history, and see its captivating architecture while going behind the scenes to meet chefs, restaurant owners, and industry experts. Along the way, enjoy two appetizers, one entree, and conclude with a mouthwatering desserts near the famous Bradbury Building. Meet your fellow guests and then set off on foot through the historic neighborhood. Start with two appetizer stops at ethnic eateries, popular neighborhood gems that speak to the local population living in Downtown. Along the way, learn about the culinary rise of Downtown Los Angeles, restoration of historical buildings, magnificent architecture, and hear stories of innovative chefs who have opened up restaurants in the neighborhood. 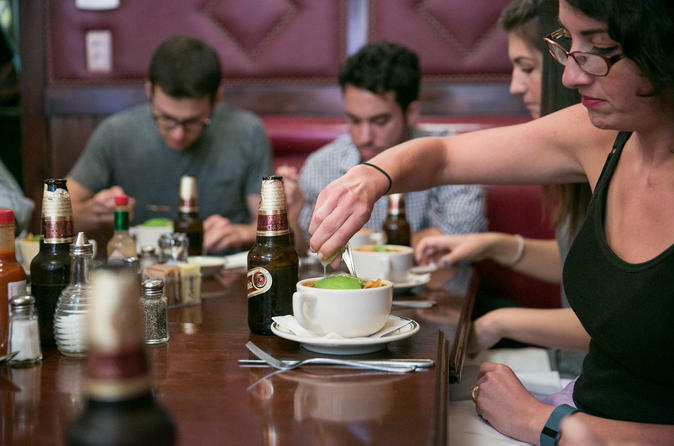 Then continue on to Cole's, known as the inventor of the French Dip sandwich, or to Nickel Diner, where you'll enjoy a delicious bowl of steaming pozole. For dessert, go behind-the-scenes at Peddler's Creamery to see how they make bicycle-churned ice cream. Your guide and four progressive food courses are included. Drinks are not included in the price, but you can purchase a drink pairing upgrade for USD $16.